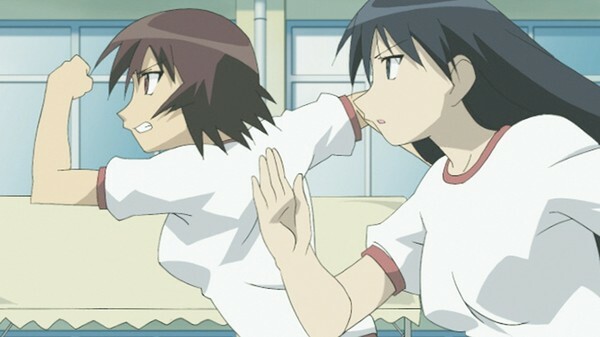 Anime fans of today may not know of Azumanga Daioh, a legendary slice of life comedy that redefined the genre in the early-2000s, paving the way for future series such as Nichijou – My Ordinary Life. It was a comedy that came completely out of nowhere and deconstructed the preconceptions of anime comedy and the slice of life concept in ways never before seen. This collection of Azumanga Daioh is a great reminder of just how monumental this series was, even a decade on since the series’ debut, it doesn’t feel like it has aged a day. The comedy is still as tight as it ever was and the affect it had on the genre is paramount. Azumanga Daioh is an underappreciated gem by all counts. While its spiritual successor Nichijou – My Ordinary Life finds the bizarre in the ordinary, Azumanga Daioh finds the funny in it. It peels back the layers on the most banal parts of every day life and finds the inherent silliness in it all. Life in and of itself has a level of silliness and Azumanga Daioh dives deep into that well and draws laughs from it like it is going out of fashion. It hits hard and fast, with a 4koma type of storytelling, that allows a lot of variation within any given episode as well as many laughs to be had. The 4koma style makes Azumanga Daioh feel like a literal slice of life (several slices technically), with each slice having a different flavour all the while being just as tasty as the slice that came before it. There is a certain amount of respect that must be given to J.C. Staff for the production of this series, it is no easy feat to create such consistent content when that very content varies often on a minute by minute basis, changing direction at the drop of a hat. This of course comes from the fact that the series originally aired in short bursts 5 times a week, only to be compiled into a full 25 minute episode at the end of every week. It was an odd structure but an effective one no doubt. Part of what makes Azumanga Daioh so very good is the fact that it features one of the most memorable comedy casts in anime history. The variation among the cast allows for a great deal of comedic combinations, keeping things fresh throughout the series entire 26 episode run. Each character is well developed in their own right, with very distinctive personalities that have gone on the be mimicked by copycat series. Chiyo-chan is of course the star of the show and the child prodigy often steals each and every scene she is in with her intelligence often supplemented by her cute nature. If you have never seen Azumanga Daioh you are surely in for a treat. Weighing in at 26 episodes, it is difficult to find a more well rounded comedy series than this. It has the perfect mix of sentiment and madcap comedy, knowing how to tow that line with deft precision and impeccable timing. 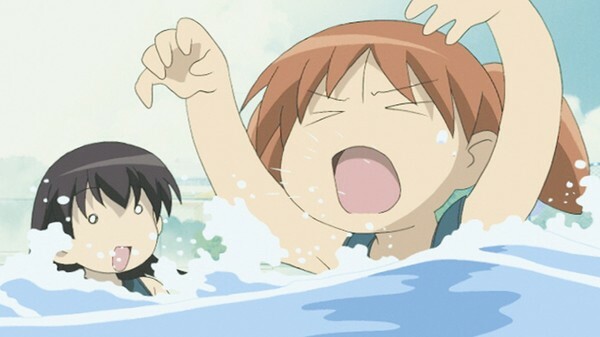 When it comes to Azumanga Daioh it goes without saying that you will laugh, long and hard until you cannot laugh anymore. It is a comedy of the highest order, a revolutionary slice of life series the influence of which is evident in slice of life anime of today. Time has served Azumanga Daioh well. In 10 years time, the series shows no signs of age, still as aesthetically gorgeous as it was all those years ago. 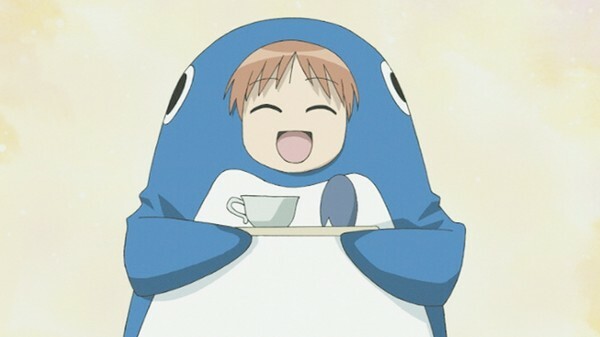 The cute character designs that feature in the series do well to complement the comedy of the series with all manner of expression on display. 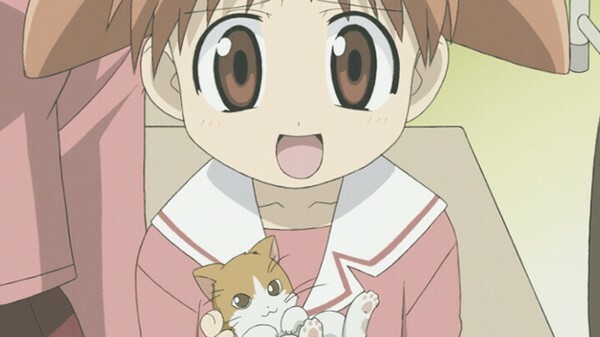 Each character is uniquely designed, particular of note is that of Chiyo-chan, who has the look of a mascot character. 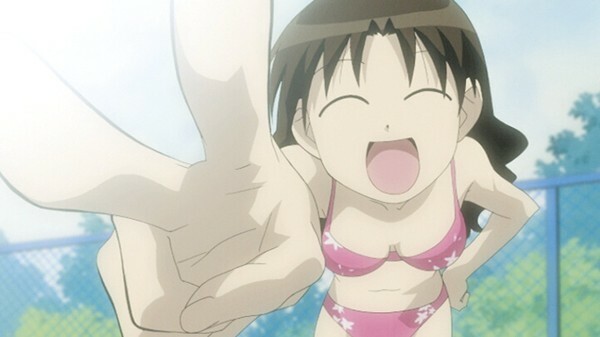 The animation on show in Azumanga Daioh still remains some of J.C. Staff’s best work, holding water to some of their currently airing anime series. Azumanga Daioh’s soundtrack is a brilliant mix of poppy tunes with silly beats that accentuate the comedic aspects superbly. The opening and ending themes are suitably cute and incredibly catchy, especially the opening theme which has an addictive quality that is hard to shake. 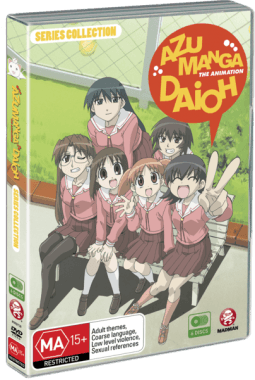 This release features the excellent English dub of Azumanga Daioh which is a pure delight, of course the original Japanese audio is also there if you so fancy watching with subtitles. Madman Entertainment have done an astonishing job with this release. For the price point you are getting more than you could ever ask for. Not only do you get the entire series compiled neatly across 6 discs, you also get a plethora of bonus content to go with it. There are production sketches, clean opening and ending themes, a character art study and even the Azumanga Daioh mini-movie. That is a great deal of content, all of which comes together to make this the definitive collection of Azumanga Daioh. What we have here is a very special anime release. 10 years on from the original premiere of Azumanga Daioh we get a brilliant re-release of this classic comedy anime. This is honestly the greatest release the series has ever had. Whether you have seen this series hundreds of times or never at all, this is the collection to own. Azumanga Daioh is a must have for any anime fan. 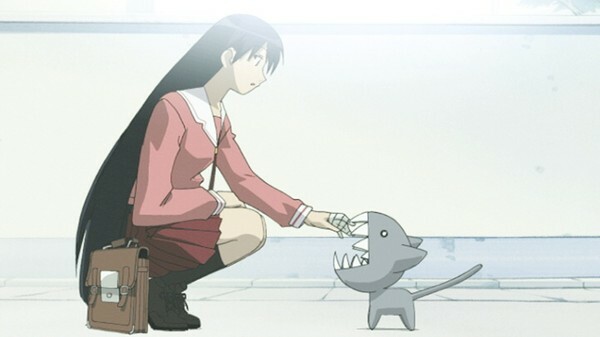 While the humour may not strike the same chord with everyone, it is impossible not to see the fun in Azumanga Daioh. This is one series that is as enjoyable as it is funny. Very few series can be called influential but Azumanga Daioh can. It paved the way for many of the comedy series of today and like a fine wine, it is better with age. Looking back on Azumanga Daioh, you come to realize just how very important this anime series was. If you haven’t hung out with Chiyo-chan and friends, or it has simply been too long since you last did, now is the time to do just that. Azumanga Daioh is Azumazing!